Includes full telematics system* allowing the alert data to be collected and serve as the basis for improvements to city infrastructure. *Telematics system is provided by a third party. There is no fee for the first year. There may be a fee subsequent years. Utilises dynamic detection angles to constantly monitor the vehicle’s blind spots from the A-pillar and on the right- and left-hand sides of the vehicle. Warns the driver that a pedestrian, cyclist or motorcyclist has been detected in the vehicle’s blind spot. A yellow signal is given if the driver needs to use caution, a red signal is given if there is risk of an imminent collision and of the need to take immediate preventative action. Alerts of imminent rear-end collision with a vehicle ahead. Alerts if the vehicle leaves the driving lane without use of the turn signal. Alerts of imminent collision with a pedestrian or cyclist ahead, during daylight. Alerts when the distance to the vehicle ahead becomes unsafe. Notifies of the new speed limit and if the driver exceeds it. External cameras constantly scan the blind spots on sides of the vehicle and behind the A-pillar. The forward-facing camera unit containing the camera, EyeQ® chip, and speaker, mounted on the inside of the windshield behind the rearview mirror. The pedestrian and cyclist blind spot warnings are displayed on two LCD displays, one placed on the right side of the windshield and the other on the left. The EyeWatch™ visual display unit mounts inside the vehicle, providing real-time alerts in the key seconds before collisions occur. 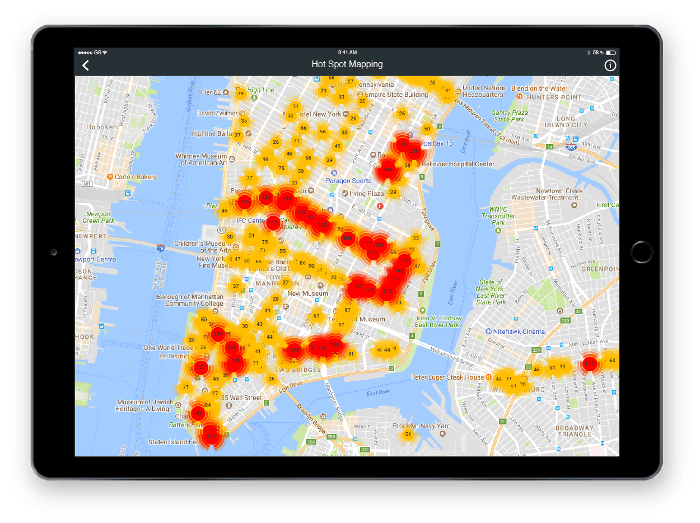 Mobileye Shield+ allows city fleet managers to access an online map displaying the hot spots on transit routes based on the alert data. This is about making our city streets safer and we are looking to avoid situations that are especially dangerous for pedestrians and cyclists, two of the most vulnerable groups of road users in urban environments.